Val did a great job with an old carpet in a rental townhouse. I'm very pleased with the result. Great job. Val is smart, thorough, and efficient. I will use company again. I am happy with my pro s work on my carpet and sofa. I would recommend Val. Val came out on a short notice, arrived on time and did a great job. I would highly recommemd him to anybody. Val completed two jobs for us recently. He was kind, arrived on time and did an excellent job in a short period of time! I just made the appointment but will do a follow-up review upon completion of work on 8-6/17. This vendor was the first to respond with a quote and answers to questions about the service, even though it was a Saturday. Very communicative regarding arrival time and did a great job!!!! Val was prompt and courteous, did an excellent job at a fair price. Great experience with Val. I would recommend them and will use them again. Val was quick to respond to my work order request and arrived exactly when he said he would. My only suggestion is to let the customer know what to expect about the carpets being wet afterward. I did not expect that, but fortunately, they dried in time for the new tenant to move in. Healthy Green-Cleaners was fantastic! Excellent customer service and they truly care about the quality of their work and the happiness of their customers. I will definitely use them next time and will recommend them to friends/family. Val did an excellent job. He provided fast response,arrived on time and he was very professional. I was really impressed and I will recommend this company to my associates. Highly recommended. Flexible when I was short on time. Job well done. Our kitchen tile grout went from black to creamy white in less than two hours--really amazing work! We are impressed. Val is great, so quick to respond and very nice. Highly recommend! They informed me when they were on their way. Nice company, I would recommend them highly. Val was friendly, knowledgeable, and prompt. My carpet looks great. I would hire him again. Very nice experience. Communication was easy, company arrived early, completed the work as promised. He did exactly what we needed and the carpets look beautiful. Will be using his services again! Very thorough and fast. Great customer service! Was on time at the location and preformed a good cleaning. The carpet looked like it was new again. Thanks will hire again on my next project. Everything went well with my carpet cleaning. This was for a move-out and Val did a great job getting out many stains we thought weren't going to go away. He was very communicative before the day of cleaning and personable and professional during the visit. We would highly recommend him and his services! Val did a superb job. Will call him again for sure! Arrived on time. Gave me a price and did a great job. Would hire again. He was very professional. Easy to communicate with. Very accommodating. Will definitely use the company again for other projects. I am extremely happy with the services provided by Val. He came early and got started on the carpets immediately. Our carpet had a lot of wear on it (4 years) and we never had it professionally clean. We tried cleaning it our selves but eventually we would see no progress. Val came in and immediately we saw the difference in the carpet. It almost looked brand new again. He was able to remove a spot on our carpet that we were told 2 years ago that it was permanent. Val provided great service at a great price (unbeatable price for 3 rooms, two stairways, and 1 hallway. ! ) We will be hiring him again! I had Healthy Green-Cleaners clean the carpets of my townhouse before I moved out. I have 2 dogs (1 which is a puppy) so there was a good amount of dirt and stains. The carpets looked like new when he was done. I'm extremely happy with the job he did and highly recommend Healthy Green-Cleaners!!! Regular carpet cleaning. He arrived on time and mostly got the coffee stain out of the carpet. He tried 3 different chemicals on the stain, it looks pretty good. Additionally, he followed up the day after to ensure everything was ok! He was on time and finished our carpets pretty quick and we were shocked how much dirt came out of them even though they are fairly new carpets.. He does a great job and I highly recommend him and will be hiring him again in the future! Healthy Green-Cleaners did a great job on the stains I had to get removed from my carpet. He stayed in touch with me allowing me to have an idea of when he'll be here. The overall job didn't take long and he did a wonderful job. The price they charge for the work are much better than any computer I reached out too. I recommend this company to anyone needing any work done on their carpets. Everything was perfect. val called came over and provided an estimate to clean and seal my grout. He arrived when he said he would and did the job in a timely manner. He called afterwards to make use everything was ok, I can't say enough positive things. I have already given his name to several friends. It was very easy to set up an appointment and communications were great. Val was hired to clean the carpet of one corridor and one bedroom that had a pet smell. He was super fast and left the carpet very clean and with a good smell. He is also helping me with an area rug. I recommend Val and will hire him again. Highly recommend! Great price and our carpets looked great when it was done. We submitted our home size through thumbtack and even over estimated. We were given a quote that when the cleaner came they decided they would have to charge extra for our 10 foot "hallway". Then when one of the rooms was our living room they only cleaned half of the room and partially rolled up our area rug, completely ignoring the other side of the room and the area under the rug. It was obvious why they had the cheapest quote. They only planned on doing 75% of the job. Additionally the one area that needed attention due to a red wine stain was only generally cleaned and the stain is still visible. We are pleasantly surprised with not only the personable service we received but also the actual work and the really good price. Val was on time, and maybe even a couple of minutes early. He called an hour before coming. He was very polite and courteous and did great work. 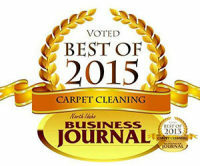 The best carpet cleaning . Healthy Green-Cleaners restored the texture of my carpet. Val showed up right when he said he would. He's very professional and meticulous. He cleaned my hardwoods and my carpets very good. The carpets dried well. All is beautiful. It was a pleasure doing business with him. I will definitely be calling him for my next rental property! Arrived at scheduled time and did a fantastic job of cleaning the carpets. Val was very professional and very prompt! Great service! Val was so easy to work with: prompt with response, didn't have to wait long for an appointment, and considerate and friendly while working in our house. Would definitely recommend Health Green Cleaners to others! Val came on a very short notice and explained to me what is to be done. He was efficient and the price was reasonable. Good job. Val did an outstanding job cleaning the carpet on my staircases. I highly recommend him for anyone looking for carpet cleaning services. He was on time and had a great personality. Wonderful Company. My results were fabulous! The communication during the process was very good. I will use them again! We could not have made a better choice! Val was very courteous, a true professional, and left the carpets looking cleaner than when we moved in to our apartment. We were convinced that certain spots of our carpet could not be saved, but he proved us wrong. Best of all, his prices were very reasonable. If we weren't moving out of his service area, we would definitely hire Val again in the future! I would highly recommend Healthy Green Cleaners. Val did an awesome job on cleaning 5+ rooms of carpet and repairing/cleaning caulk and tile in a bathroom. Very courteous, professional, trustworthy, and knowledgeable. Products are effective and environmentally friendly. Affordable costs and great value. Val did not leave until I was fully satisfied. Will use this company again. Val did a great job cleaning our carpets. There was odors from the former owners pets that he was about to remove. Quality service provided for a move out from 4 level town home. The service provided exceeded my expectations I highly recommend Healthy Green Cleaners for carpet services. Fast, high quality and professional service. I will be calling Val in the future. Val was wonderful and did a great job cleaning carpets. No residual cleaning smell afterwards! Val was very punctual and friendly. Highly recommend Healthy-Green cleaners, especially for anyone with asthma or cleaning product sensitivity!! Service was on time and done quickly! Very friendly and job well done!! Val was great! He answered all our questions, was on time, very thorough, and professional. We are very happy with his work and how clean our carpets are! Thanks, Val! Val was on time, thorough, and left no mess behind! A simple carpet cleaning, two rooms and a stair case. Val was prompt, called when he was on the way, respectful and efficient. The carpets came out better than I expected and the house still smells clean. Good job, good price, would hire them again. Val gives quality service...he really works with problem areas. Hi, Val we do not have your email or phone number. We simply sent a quote via thumbtack and never received a reply. Our office number is 202 415 9709 and our email is healthygreencleaners@gmail.com..
We hired Val to clean all the carpeting in a vacant rental property. He gave a time window for when he would arrive, and he called within that window to tell me just when he would arrive. My husband was at the site and said, he was polite, professional, efficient, and explained everything he was doing, and what to expect from one area of the carpet that seemed to clean well but it may not dry as well. My husband was shocked at how well one room looked because we were sure it was not salvageable. If the stains leach back up to the top of the carpet again, Val is the first person we would call, and I would use him for our personal home. Val did an excellent job cleaning one of our bathoom's white tile floor. He came when he said he would, explained exactly what he was going to do and got right to work. The grout had ground in black dirt so he said he'd try to clean a small section first and if it didn't clean up satisfactorily he'd stop and there would be no charge. Fortunately, he got it bright white again. What a difference! He's coming back to do another bathroom floor. I recently bought a house, and the carpets were badly stained from the previous owners, two kids and two dogs. I was hoping that I would not have to replace the carpets. Thankfully, Val did an excellent job cleaning carpets in 4 rooms and a set of stairs. I was amazed that he was able to remove all of the stains. The carpets look brand new. The price was very reasonable, and there were no unexpected charges. I will definitely use Val again in the future. Very good service but kind of expensive, especially because of the per room charging policy. Val was very responsive and flexible with us. He was friendly and professional with me and with our children. Outstanding service. On time, courteous, helpful information in advance, and great results at a great price. Val did a terrific job cleaning the grout in my bathroom and was very reasonably priced! Would recommend him to anyone. Val arrived at scheduled time this morning 8 a.m this morning. He did a great job. Great green products. No chemical smells. Will recommend him to the my new renters as they need their house done before they move into my unit. The carpets look great! We bought a home with older carpet, Val brought it back from the brink of extinction! Excellent job. Plus Val was very knowledgably of the cleaning process. I had a great experience using Healthy Green-Cleaners to power wash my fence and small porch at my townhome. The job turned out to excellent. Val does excellent work and is very professional. On time and did an outstanding job! They will be my first choice for carpet/house cleaning. Very happy! Carpet looks SO much better! On time, and very courteous. Great work. Thank you! Val is truly a professional. When I first spoke with him we discussed the best care for Stainmaster carpet and he certainly provided all of the informtion that I needed for future care and cleaning. He also explained his equipment and plan for the cleaning. It all worked for me since I had pet stains (puppy) and not so new nor recently cleaned carpets. Since I live in a condo having the hoses attached to a truck was not possible. Val arrived right on time with the equipment he had described to me. He was polite and went right to work on a job that I considered to be a bit troublesome. When he was finished I was more than satisfied with the way my carpets looked and that the offensive odors were gone. Val charged exactly what he had quoted, I will definitely use him again and highly recommend him. He was as pleasant when he left as when he arrived. Val came right on time. Spent time treating cat soiled spots cleaned and deoderized our rug with great care. He even followed up with a phone call the next day. Friendly and professional. Would highly recommend and will use again! I used this company to clean my tile and grout. Excellent work from estimate through job completion. Received multiple estimates and Healthy green Cleaners was competitive on price. More importantly, the service technicians arrived on the scheduled date, moved furniture and did a phenomenal job of restoring all our tile floors. The job was completed in 1 day as promised and the service technicians were thorough and efficient. Our previous owner had neglected to maintain the floors properly and I was amazed at the results, our floors look brand new.